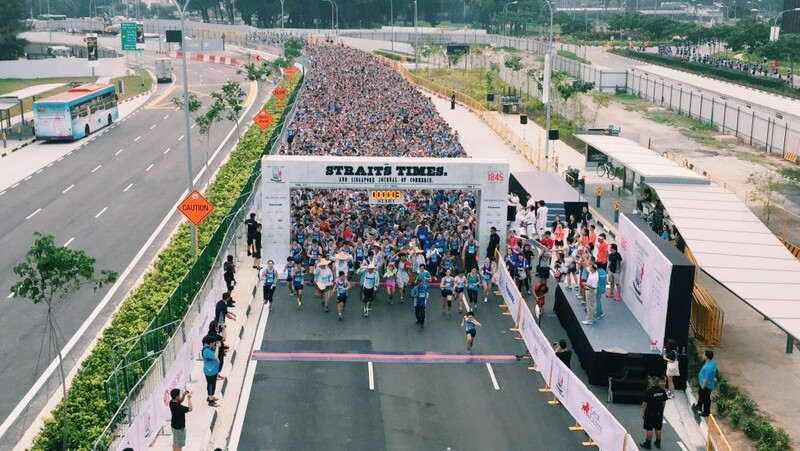 Race Review: The Straits Times Run at the Hub 2015 [10 km] (by 'Ah Girl') | JustRunLah! The Straits Times, Singapore’s leading newspaper and media, had its beginnings 170 years ago in 1845. To commemorate this special anniversary, a new race category of 18.45km is introduced this year in addition to the 10km competitive and 5km fun run. 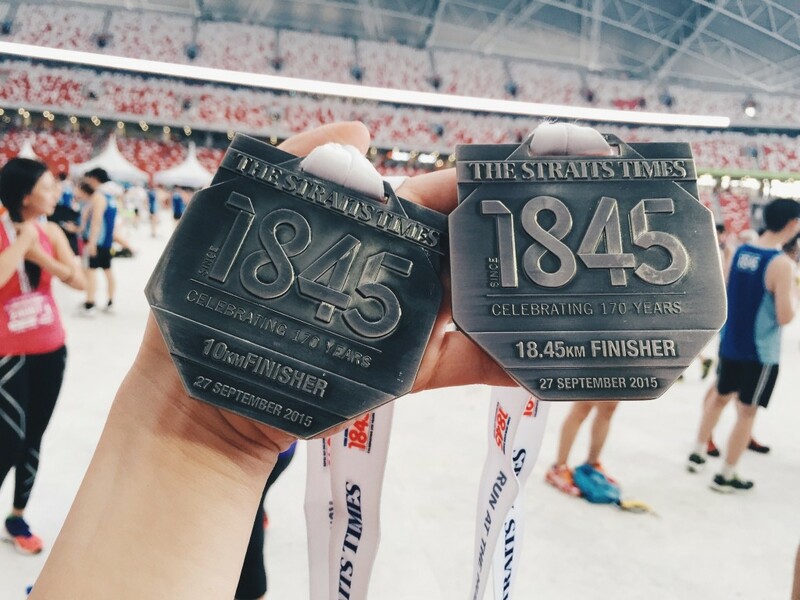 This interesting category is most popular among runners and comes with an exclusive 1845 finisher t-shirt! 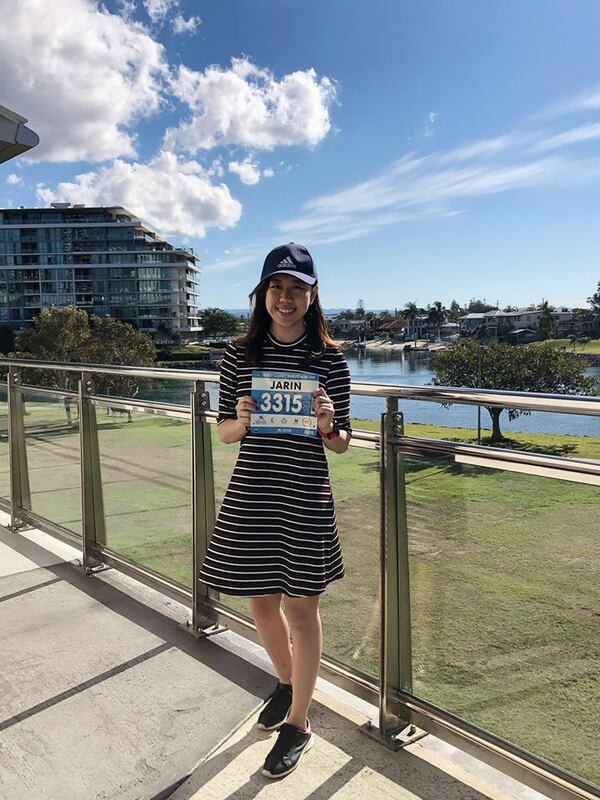 Due to overwhelming popularity, I was unable to get any slot for 18.45km category and went on to sign up for 10km anyway and was glad that the haze condition did not affect today’s race at all! Race day: Baggage deposit, Flagging-off and Haze-free! Upon entering the 100plus promenade tracks at around 5:50am, I was directed towards gate 15 along with other participants towards the starting pen and baggage deposit area. After going down multiple escalators, we finally arrived at the spacious carpark which was converted into a temporary baggage area, with rows of barricades and volunteers. The entire process was fast, efficient and all the walking became a pre-race warm-up for me as I made my way to the starting pen. The scheduled flag-off time is 6:30am for 10km and it was already 80% full by the time I got there around 6:05am. Perhaps it’s my first time taking part in such a huge-scale race event, I was rather overwhelmed by the amount of people and energy at the starting pen! After some warming-up exercises and countdown, off we go! Thanks to the clear, haze-free weather, I was able to run without worries and the musical performances at multiple zones throughout entire route really made the run much more entertaining and fun! Oldies and classics from Beatles, Elvis Presley and more were played and my favourite has got to be the performing group near the Marina Barrage! This was an unexpected surprise and I hope to more of such elements in future races! Clear distance markers were spotted, hydration stations were sufficient and there were many volunteers to cheer us on. The only issue I encountered were slight bottlenecks at certain points in the race, especially the last 3km, which were unavoidable given the large number of participants. It would be great if participants keep to one lane if they decided to stop running and allow fellow runners to pass. I was lucky to have a runner in front of me who was exclaiming, “Walkers on the left! Runners on the right!” during our last 2km towards the Sports Hub. The last 1km was what I had been anticipating for and the reason that kept me going – to land my footsteps on the legendary tracks of the National Stadium. Such opportunities are rare and the exuberant feeling when I ran into the stadium and onto the tracks made me feel like a champ! I guess everyone else felt that way too! Still awed by the humongous and spacious stadium, I simply sat and admired the surroundings, took some photos and was glad to be part of this historic race! There were many lucky draw and contests happening around the carnival area with exciting prizes to be won. Unfortunately I did not leave the Sports Hub in a Land Rover…better luck next time! 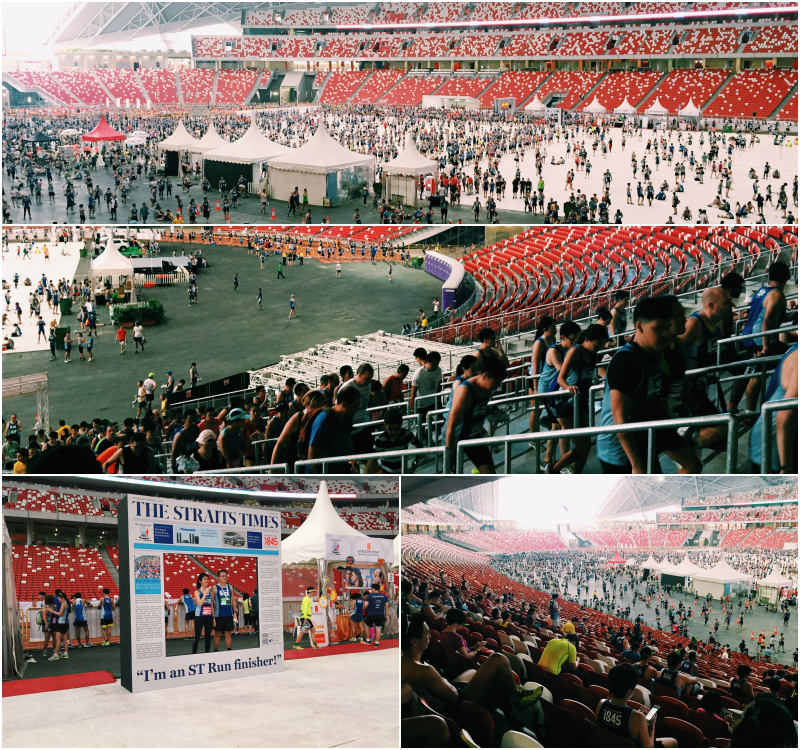 The organising committee of the ST Run at The Hub 2015 deserves double thumbs up for their consistent efficiency in race event logistics and management from pre-race to race day. More importantly, they handled the haze situation well, with multiple SMS notifications before race day. The entire race felt like a journey through memory lane, where iconic new and old landmarks of Singapore stand tall and proud along with music and images of the past. I am quite sure everyone had a good time today and congratulations to all finishers, lucky draw winners and race winners! 2. (minor) Generally too many kinks and turns on the 18.45 track. Not conducive for best timing. 3. (major) National stadium opened to spectators much too late. Neither could my family see the winner nor myself crossing the finish line. What’s the point then on having spectator tickets? It felt like running into a ghost stadium, nobody around but a handful of runners who had finished ahead and the staff manning the finish line and medal tables. Are the carnival and spectators only meant for slower runners? 4. (major) The results are still not out. It is now more than 50 hours after all races’ cut of times and there are still no results out. An organisation that lives off selling NEWS should know better than that.